I watched A Royal Night Out this weekend, which is another Queen Elizabeth II centric property currently streaming on Netflix (it was directed by Julian Jarrold who helmed two episodes of The Crown). It’s a not-that-great farcical romp that heavily fictionalizes the night Elizabeth and Margaret went out incognito to celebrate V-E Day among the common people. And while it doesn’t hold a candle to The Crown in terms of quality, it did get me thinking about the choices that go into dramatizing real-life history. The royal family really love each other in A Royal Night Out (in real-life, they referred to themselves as “We four”). Margaret and Elizabeth in particular have a lovely, warm friendship throughout the movie. They enjoy spending time with each other and that made me invested in them both as individuals and as a pair. A Royal Night Out spins history into cotton candy fantasy and that makes it easy to dismiss as “unrealistic” (and don’t get me wrong, it very much is). But I have to wonder if The Crown is perhaps equally unrealistic in how perpetually somber it is. We tend to associate doom and gloom with verisimilitude, but painting with an entirely sad brush is as unrealistic as painting with a perpetually happy one. Do I believe Elizabeth and Margaret frequently had a tense relationship? Sure. Do I think they never had a single warm, friendly conversation in their entire young adult lives? Of course not. In only showing us scenes in which Elizabeth and Margaret snipe at each other, The Crown is cherry picking history just as much as a biopic that focuses solely on happy moments. And repeating the same cold, distant beats—as The Crown does for so many of its central relationships—makes it hard to root for any of these people. In case you can’t tell, I really wasn’t a fan of “Gloriana,” and I actually found it pretty tedious to watch at times. That’s because unlike the Churchill story in “Assassins” or the Queen Mother story in “Pride & Joy,” there are no surprises to be had. Elizabeth is once again pulled between her loyalty to her family and her loyalty to her position. And once again she puts the importance of the crown above her personal desires. Obviously The Crown can’t rewrite history, but it can (and does) make choices about how to present that history. And “Gloriana” falls back on choices we’ve seen dozens of times before in this series. It doesn’t help that “Gloriana” is a direct rehashing of the arguments we already saw in “Gelignite.” Elizabeth thought that asking Margaret to delay her engagement for two years would fix the problem of the Royal Marriages Act. Instead it turns out it just kicked the problem further down the road. After an entire episode designed to drive home the idea that Elizabeth is a foremost constitutional scholar, it seems odd that her big downfall comes because she forgot to read the second half of the Royal Marriages Act. We learn that Tommy Lascelles, Michael Adeane, and the Queen Mother basically colluded to keep that information from Elizabeth, assuming Margaret would grow disinterested in her two-year mandated break from Peter. That makes sense, but it just seems odd that Elizabeth never thought to read the Act herself or that no newspaper in Britain reported on the piece of law keeping the country’s favorite lovebirds apart. The way things unfold here just makes everyone involved look stupid. And rather than mine that stupidity for dramatic irony, The Crown just presents it as fact, which makes for a frustrating viewing experience. I can kind of understand Tommy and Michael’s “wait it out” plan, but why would they literally wait until Margaret’s 25th birthday to break the bad news to Elizabeth? Why not warn her a few months in advance as it was becoming clear that Margaret and Peter’s romance hadn’t fizzled? And how could Elizabeth be such a constitutional expert yet not be familiar with the one passage most relevant to her family? The Crown also does a terrible job of explaining just what Elizabeth’s choices are in the matter. As I understand it, both Parliament and the Church are against the marriage, which means Margaret’s only option would be to give up her titles and money and essentially leave the family in order to marry. Yet Margaret and Phillip keep acting as if there’s a way for Elizabeth to overrule that and support the marriage anyway. Can Elizabeth actually issue a royal decree going against Parliament and the Church? Or are Philip and Margaret just living in a fantasy world? I have no idea and The Crown doesn’t make it clear. The whole episode hinges on Elizabeth having to pick between her family and her position, but I don’t understand what the mechanics of picking her family would even look like. The lack of clear stakes rob her choice of dramatic tension. Elsewhere, the show continues to drill home the idea that Philip is a huge jerk. Even close to three years into his wife’s reign he hasn’t settled into his role as the Queen’s consort. Weirder still, the episode makes no mention of what seemed to be their game-changing fight in “Assassins” (I guess mouthing “I’m sorry” at the dinner table fixed everything?). We pick up on Philip and Elizabeth on relatively chummy terms, even though he’s still railing against just about every element of his royal life, including Elizabeth’s suggestion that he visit Australia on her behalf and take a refreshing vacation in the process. It’s immensely satisfying to watch the Queen Mother put Philip in his place while they’re paired together during a royal dance (“You have more freedom than any consort in history and you repay it by scowling and skulking like an adolescence.”). But her words—like most of the advice aimed Philip’s way—seems to fall on deaf ears. And that brings me back to A Royal Night Out and it’s happy-go-lucky take on history. Because The Crown’s characters have been so tense and distant for the majority of series, these latest fights just feel like more of them same. Showing some genuine warmth in the Elizabeth/Margaret and Elizabeth/Philip relationships would make the moments of conflict land more strongly. As is, we’re told Elizabeth is betraying her close sisterly bond to Margaret, even though they don’t seem to have a close sisterly bond outside of playing clapping games in their nursery when they were children. 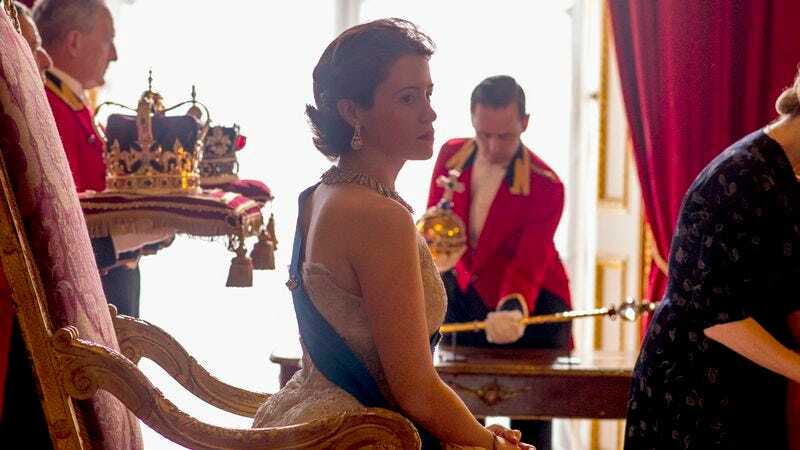 What saves “Gloriana” is what saves every episode of The Crown: Lush production values and stunning performances. Vanessa Kirby in particular does phenomenal work as it silently dawns on Margaret that her sister is actually going to deny her engagement. And as performers, Claire Foy and Matt Smith remain compelling to watch, even when their characters make frustrating choices. We also get the welcome return of Alex Jennings when Elizabeth places a last-ditch call to her uncle to ask his advice. Though he’s had relatively little screen time, Edward is the perfect example of a character who’s allowed to be truly multifaceted, unlike, say, Philip in the later episodes. While the show has made a point to highlight his unlikable qualities, it’s also contrasted that with Edward’s humanity as well. Margaret’s situation with Peter neatly mirrors Edward’s situation with Wallis. Yet while he claims his sympathy is with Margaret, he advises Elizabeth to take the opposite approach he did: Put her position above her happiness. (At least that’s what it boils down to once you peel back his unintentionally hilarious flowery language.) But while her choice is different, the result is the same: Elizabeth winds up hurting Margaret just as Edward hurt George. Brother betrays brother, sister betrays sister, the crown continues on unscathed. The Crown has consistently drilled home the idea that the monarchy is as much a prison as a privilege. At its best, the show has explored ideas beyond that too, from gender dynamics to political sea-changes to natural disasters to questions of self-improvement and self-worth. “Gloriana” falls back on simpler themes, which unfortunately makes it a disappointing capper to a very strong season of TV. Here’s hoping The Crown embraces both the lows and highs of history when it returns for a second season. In real life, Elizabeth and Eden apparently drew up a plan for Margaret to marry Peter without having to give up her money/title or leave the country (she would’ve had to renounce her place in the line of succession though). Eden even wrote in a letter to the Commonwealth prime ministers, “Her Majesty would not wish to stand in the way of her sister’s happiness.” Despite that, Margaret announced her breakup with Peter three days later. That’s basically the exact opposite of what unfolds on the show. When Peter Townsend came to work for King George VI he was a 30-year-old-man with a wife and a small child. Margaret was only 14 years old. (In fact, he was one of the adults who chaperoned 14-year-old Margaret and 19-year-old Elizabeth on their V-E night excursion.) She reportedly fell in love with him a family trip to South Africa in 1947—she was 17 and he was 33. The show has made no mention of any of that. And finally, I still remain uncomfortable with this show’s somewhat half-hearted attempt to present imperialism in any sort of negative light. Here Eden’s conflict with Gamal Abdel Nasser basically boils down to the idea that the British are just too polite and those darn Egyptians are just so overly sensitive! Perhaps it’s all meant to be a commentary on how the British view their Empire, but that only works if the show’s viewers already have a solid understanding of the critiques of imperialism. I’m not sure that’s a given. It was very nice to see Jared Harris back again. “I tend to remain in sulk for at least a week.” Margaret’s self-awareness is delightful.